Arrival Noi Bai International Airport, Hanoi, meet the tour guide at the airport, transfer to the hotel, free at leisure. After breakfast, transfer to Pu Luong Nature Reserve - is located roughly 180 South West of Hanoi - by road via a breathtaking taking mountain pass giving you a panoramic view of the whole valley, photo stop on the way with best view of the mountain. Arrival at local restaurant in time for a delicious lunch, followed by free time to explore the beautiful retreat, with its captivating panoramic views and tranquil setting. After lunch, visit Pu Luong - all the highlights of Northern Vietnam in one place! Pu Luong is a “microcosm” of Northern Vietnam. Containing magnificent mountain ranges, stunning rice terrace fields, scenic rivers and waterfalls, breathtaking mountain passes and authentic villages of Thai and Muong minorities. Transfer to Mai Chau, take a short walk or cycle through the village of White Thai Minority (Pom Coong Village, Lac Village, ...) where you will be welcomed by the friendly local people, communicate and discover their lifestyles. Take it all in: the spectacular scenery of Mai Chau and the relaxed rhythm of local life. After breakfast, departure to Son La. Stop to visit the hamlets scattered around the Muong Minority Yen Chau and Moc Chau. Lunch during the trip. Arrival in the province of Yen Bai. Today we are crossing Cao Pha Pass on the bumpy road and visiting bee-growing farm and some minority groups on the way until you get to Mu Cang Chai town. Enjoy and the beauty of the Mu Cang Chai terraced rice fields as weel as the unique cultural character of the Mong ethnic minority group in Yen Bai. After breakfast, stroll around Sapa. Then, get in the car and head towards the village of Lao Chai San – a village of Black H’mong Minority. Cross the river using the suspension bridge to reach the village of Lao Chai. Short hike to the village of Ta Van – village Dzays Minority. Have dinner with the host and spend a night with the locals. Visit the Bac Ha Market if this on Sunday otherwise, we will visit local village around Bac Ha. Lunch then leaving Bac Ha arrive in Ha Giang - the province's residents consist mainly of ethnic minorities with a village of Hmong, Tay, Dao and Nung ethnic groups. The remote region of Dong Van is renowned for its rugged mountains and beautiful hill tribe villages. Today you will discover some of these charms as you visit the ancient royal Hmong’s house. 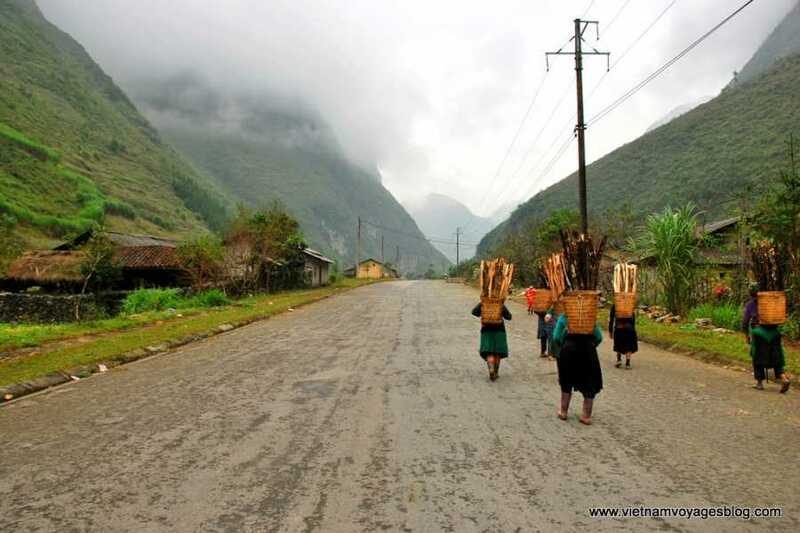 The trip to Ha Giang offers you the opportunity to admire the local costumes, discover hidden mountains and begin to appreciate the rhythm of this rural lifestyle. After breakfast, depending on the day we will visit the open-air market of Dong Van. The market takes place every 6 days, meaning the market rotates across the days. For example, if the market takes place Sunday, next week it will place Saturday and the following week on Friday. You will then we climb up to the French fort Pu Lo, built in 1890 and decommissioned in 1945 but perfectly preserved. You will then travel along the Ma Pi Leng Pass which sits at a staggering elevation of 2000 meters. This sweeping mountain offers spectacular views of terraced fields of hemp running down to the valley of Meo Vac. After lunch in Meo Vac town, we then drive to Bao Lac. Driver to Ba Be where Tay, Nung, Dao, Thai Minority live in their stilt houses. Walking to discover the villages at Po Lu. Return to Hanoi. On the way to visit tea hill and Ethnic Museum in Thai Nguyen. After breakfast, free at leisure till time to transfer to the Noi Bai International Airport your departure. End of service.